From tall, futuristic skyscrapers to traditional pagoda-inspired towers, Shanghai is full of stunning architectural marvels to gaze at. The city has its own share of Gothic, Romanesque, Colonial, and Soviet styles of architecture that embellish buildings in art districts, financial centres, and riverside promenades. This diverse and unique set of awe-inspiring constructions make for exciting sightseeing opportunities for tourists in the city. Nevertheless, it is not very difficult to go off track and get lost in the hustle and bustle of the third most populous city in the world if you do not know which spots to visit. Fret not! We have put together this list of famous buildings in Shanghai that you should go to when you are in this global financial centre. This radio and TV tower held the distinction of the tallest tower in China until 2007 before it was surpassed by the Shanghai World Financial Center. The tower has 11 spheres through its length with 15 observation decks and one revolving restaurant at the top. Situated in the Bund, the Oriental Pearl Tower draws in visitors that flock here to watch the lustrous display of colours when the tower is lit up at night. When you are in Shanghai, you must pay a visit to this 128-storied skyscraper that is the second tallest building in the world. The world’s fastest elevators here will skyrocket you up to the top at a speed of 46 mph. At the top, is the world’s highest observation deck at a height of 562 m that lets you take in a sweeping view of the city. The entire experience of having a 360-degree glimpse of one of the world’s most important financial hubs at such a height is mind-blowing and should not be missed. 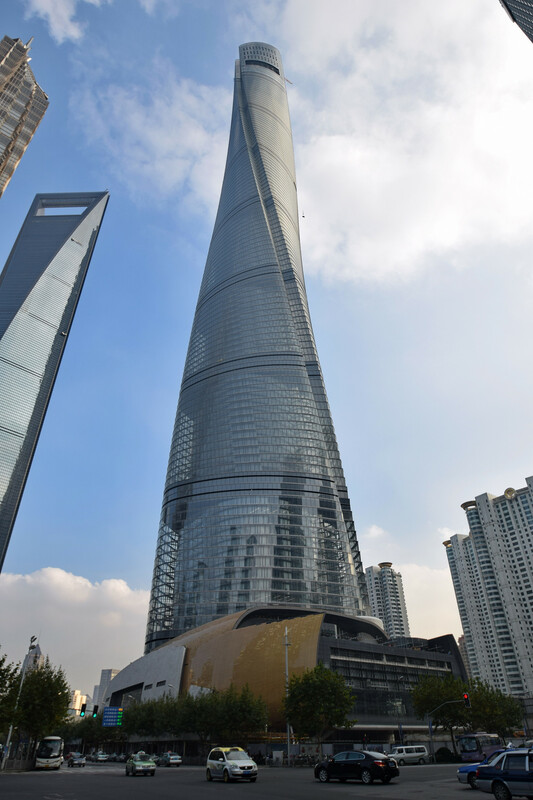 Opened to the public in 2008, the Shanghai World Financial Center ushered in the rise of Shanghai as a global commercial powerhouse to the world. With a grand total of 101 floors, this tower hosts the offices of a number of international financial companies. Owing to its distinctive shape it is also referred to as “the bottle opener ” tower. Situated next to the Shanghai World Financial Center, is the Jin Mao Tower along with its adjacent super tall skyscrapers form the Lujiazui skyline. “Jin Mao” means “golden luxuriance” and the composition and decor of this tower do fair justice to the name. Number eight which is considered auspicious in China was used as a motif while designing the tower with eight columns and an octagonally shaped core. The tower has 88 occupied floors with a 60 m long glass platform on the 88th floor that lets you take a walk with an impressive view of the Huangpu River. Once a favourite of celebrities like Charlie Chaplin, this Art Deco hotel is as glamorous as it can get. The hotel serves as a sought-after venue for opulent weddings and high profile meetings and was used as an inspiration for the novel “Shanghai 37” by Vicki Baum. The hotel is located in the central region of the city on the banks of the Huangpu river in the Bund. From its signature restaurant Dragon Phoenix to its legendary Jazz Bar, this hotel gives you plenty of options to indulge in traditional extravagance. Built during the Song dynasty (960 - 1279 AD), the Longhua temple is a tranquil and charming Buddhist temple that has stood the test of time. Dedicated to Maitreya Buddha, it is the most authentic temple complex in Shanghai that still preserves the original architectural elements of the time period when it was built. Every year, the blossoming of peaches in the widespread gardens here is observed by many local and overseas visitors. Also known as the China Art Palace, this exceptional museum houses exhibits and artworks that showcase the history and evolution of Shanghai. The museum has five floors and is one of the largest and most iconic museums in Asia. It is recommended that you pick up an audio guide to make the most of your visit here. Located in the old city of Shanghai, Yuyuan Garden or Yu Garden encompasses a rockery with cliffs and caves, a chamber of ten thousand flowers, enchanting ponds and three big halls. It was built during the Ming dynasty (1368-1644 AD) and still has its elements of design intact. The high spot of the museum is the Jade Rock which is a huge striking boulder with 72 holes that was exquisitely carved for the Emperor of the Song Dynasty. This Art Deco style dance hall and nightclub was all the rage back in the 1930s and 1940s in Shanghai. The Paramount has been revamped with decors similar to the older one and gives you a glimpse of the vintage era Shanghai elite. Live bands perform every night here with older and younger folks dancing the night away. This museum takes you a hundred years back in time to the life in a Shikumen (stone-gate house) home. The museum has three storeys with the traditional architecture of the 19th century. You can find hanging clothes, old framed photos, ladies makeup and other vintage items here to give you an authentic feel of life in 1920s Shanghai. Located in the Xintiandi area, the museum is open till 10:30 pm. Make sure you fully explore this interesting place to learn about life in ancient Shanghai when you are here. For a city that has had such a phenomenal growth in industrial influence and economic development in the last century, Shanghai still has its traditional landmarks secure and tucked in along with its financial towers and skyscrapers. Visit the mentioned list of buildings to get the best of what this historically rich industrial port city has to offer! When I am not travelling or writing, you can find me perfecting my Spanish, binge watching Netflix , reading, swimming in the ocean or just daydreaming in a hammock.